* Made of engineered high-imapact plastic. * 4 X 4 top surface area aids in proctection. The DISC is designed to prevent impalement of a 250 pound worker from a height of 7 1/2 feet. Protective covers are not allowed for fall distances in excess of 6 feet. DISC is available in two sizes. DISC-10 fits #3-#10 bar sizes and DISC-20 fits #8-#20 bar sizes. Both sizes are available twenty-five to a carton. 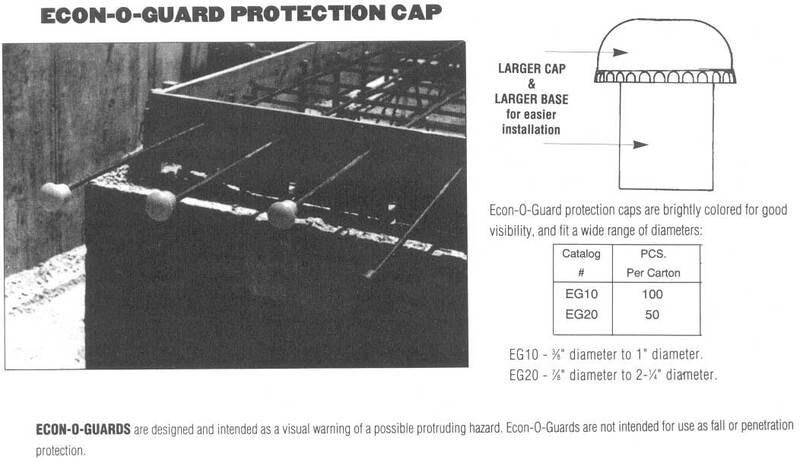 Econ-O-Guard are designed and inteded as a visual warning of a possible protruding hazard. Econ-O-Guard are not intended for use as a fall or penetration protection.